The Calendar provides the best way to review your past workouts and gain an overview of your training as a whole. 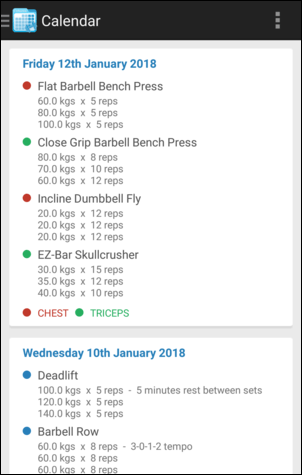 You can browse through your workouts using 2 alternate views (Month View and List View), drill into specific workouts as necessary, and use the extensive filtering options to focus on specific areas. Tap the button on the Home Screen to open the Calendar. 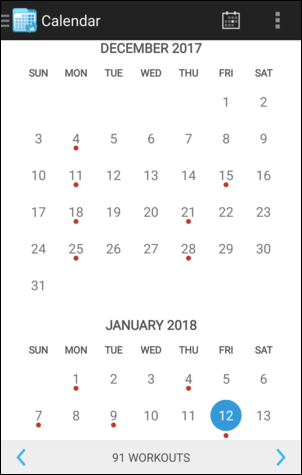 When you open the Calendar from the Home Screen the Month View will be displayed by default. The categories (muscle groups) of the exercises performed in each workout are represented by the coloured circles displayed beneath each day. Tap a day in the Calendar to view the full workout performed on that date. Tap an exercise within the workout to view the Exercise Overview. Workout Panel: Displays a panel within the bottom-half of the screen which contains the workout performed on the currently selected date. Serves as an alternative to the workout being shown in a popup when a date is tapped and may be preferable on devices with larger screens. 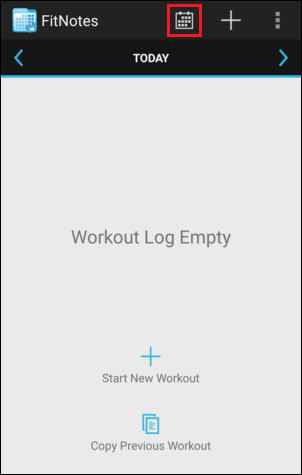 Swipe left and right within the Workout Panel to jump between workouts. 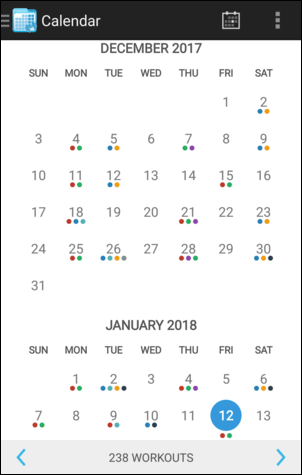 Category Dots: Displays the coloured dots beneath each day representing the categories (muscle groups) used on that date. If this option is disabled then workout dates will be highlighted using a single blue circle instead. 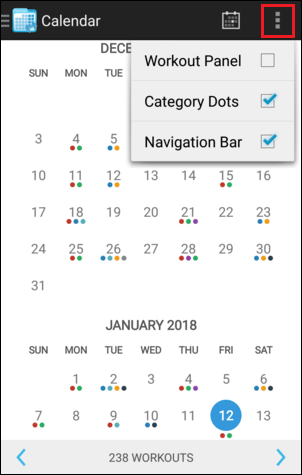 Navigation Bar: Displays the navigation bar at the bottom of the screen containing the total number of workouts shown in the Calendar (accounting for any filters applied). 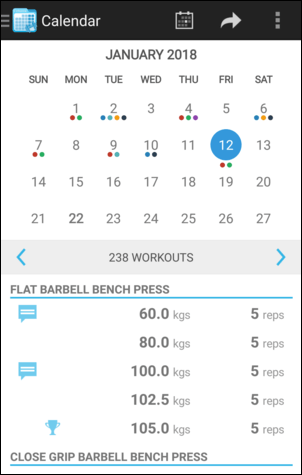 Tap the workout count to view the workouts in a list. Tap the and buttons to select the previous/next workout date respectively. Tap the FitNotes logo at the top-left of the Calendar screen or swipe in from the left edge to open the navigation menu and then select List View. 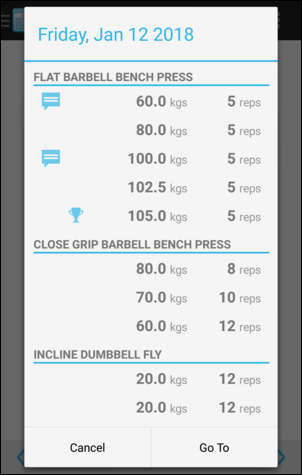 The List View displays an easy-to-read summary of each and every workout you have logged - with the most recent workout displayed at the top. You can scroll down through your past workouts or tap a workout in the list to view the full details. Category Dots: Displays the coloured dots to the left of the exercise names to indicate the category that they belong to. 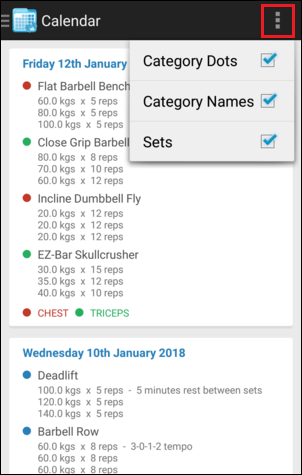 Category Names: Displays the colour-coded names of the categories at the bottom of the workout summary which allows them to be referenced quickly. Sets: Displays the details of each set performed for an exercise beneath the exercise name. You can apply a filter to the Calendar if you would like to view only those workouts which contain a specified category or exercise. Tap the FitNotes logo at the top-left of the Calendar screen or swipe in from the left edge to open the navigation menu. 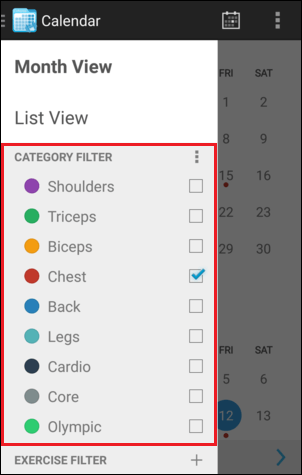 Tap the checkbox next to a category (muscle group) to the view the workouts which contain one or more exercises belonging to that category. 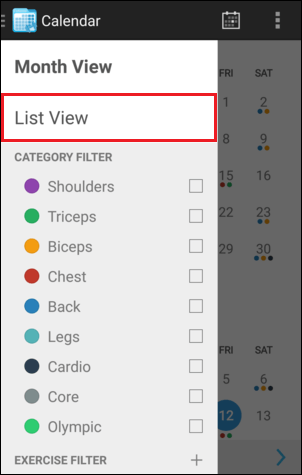 The Calendar will immediately update to display only the relevant workouts and this applies to both Month View and List View. You are able to add multiple categories to the filter at the same time. Match All: Only workouts which contain exercises belonging to ALL of the selected categories will be displayed. 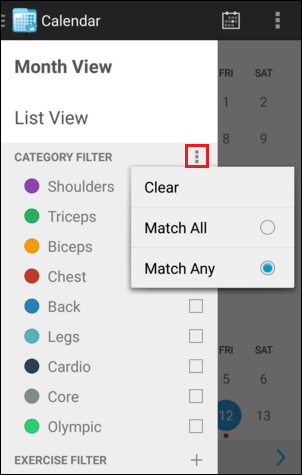 Match Any: Workouts which contain exercises belonging to ANY of the selected categories will be displayed. 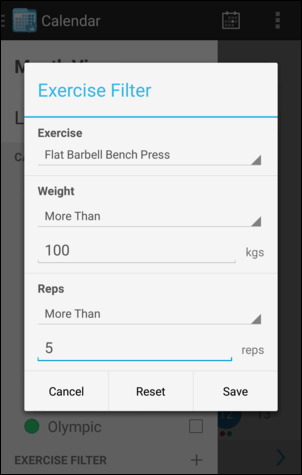 Tap Exercise Filter and you will be prompted to select an exercise. Once an exercise has been selected you can enter advanced filter options if required. For example, you can find workouts where you performed 'Flat Barbell Bench Press' and lifted at least 100 kg for 5+ reps. Tap Save to apply the filter. Tap Reset to remove the filter.